an ulcer due to local interference with circulation; persons most at risk are those who are emaciated (nutritionally deficient in protein), obese, immobilized by traction or anything else, diabetic, or suffering from a circulatory disorder. Because urine and feces contribute to skin breakdown, incontinent patients are at high risk. Absence of sensation, advanced age, and immunodeficiency are also risk factors. Called also decubitus ulcer and, popularly, bedsore or pressure sore. Three major factors in the development of pressure ulcers are (1) prolonged pressure on a part due to the weight of the body or a limb; (2) a shearing force that exerts downward and forward pressure on tissues beneath the skin (this can occur when the patient slides downward while sitting in a bed or chair, or when bedclothes are forcibly pulled from under the patient); and (3) nutritional status: good nutrition is essential for preventing pressure ulcers and healing already existing ones; a dietary deficiency should be suspected with a loss of 5 per cent or more of body weight or a serum albumin level below 3.5 mg/dl. A pressure ulcer usually occurs over a bony prominence at the sacrum, hip (trochanter), heel, shoulder, or elbow. The lesion begins as a reddened area, which can quickly involve deeper structures and become an ulcer. Prevention. Repositioning the patient must be done as often as necessary to prevent impairment of circulation to any one part. For some patients this may mean turning and repositioning every hour. Gentle massage of the area stimulates circulation to the areas most likely to be affected, but reddened areas should never be massaged, because massage encourages tissue breakdown. Thorough cleansing, especially to remove perspiration, urine, and feces, helps prevent chemical breakdown of the skin and aids in the removal of bacteria. Numerous different pressure-relieving devices are available. Stages. For purposes of assessment, treatment, and evaluation of effectiveness of nursing and medical intervention, the pathologic changes occurring in the development of a pressure ulcer are divided into four stages. In Stage 1 the area of skin is deep pink, red, or mottled. Digital pressure on the area will cause temporary blanching for up to 15 minutes after pressure is released. The skin will feel very warm and firm or tightly stretched across the area. At this stage no destruction of tissue has occurred and the condition is reversible. It is essential that the area be relieved of prolonged pressure, and that shearing forces be avoided. The reddened area may need protection by covering it with either a transparent film or a skin barrier. Stage 2 is characterized by blistering, cracking, or abrasion of the skin. The surrounding skin is reddened and probably will feel hot or warmer than normal. Since there is now an opening in the skin for the entrance of bacteria, treatment must include cleaning the wound and providing some type of dressing or cover in addition to relieving pressure on the area. Stage 3 is characterized by a craterlike sore with involvement of the underlying structures. Bacterial infection is almost always present at this stage and accounts for continued erosion of the ulcer and the production of drainage. Irrigation of the wound usually is done each time the dressing is changed. Wound débridement may be necessary to promote healing. At Stage 4 there is deep ulceration and necrosis involving underlying muscle and possibly bone tissue. At this point the ulcer usually is extensively infected. It can be dry, black in color, and covered with a tough accumulation of necrotic tissue, or it can be wet and oozing dead cells and purulent exudate. Deep and extensive ulceration and tissue loss may require surgical repair with myocutaneous flaps to close the defect. Topical applications vary widely. The diligence with which the prescribed regimen is carried out greatly influences its effectiveness. Guidelines summarizing current recommended practice for the treatment of pressure ulcers (publication number 95-0653) are available from the Agency for Health Care Policy and Research, P.O. Box 8547, Silver Spring, MD 20907-8547 (telephone 800-358-9295). 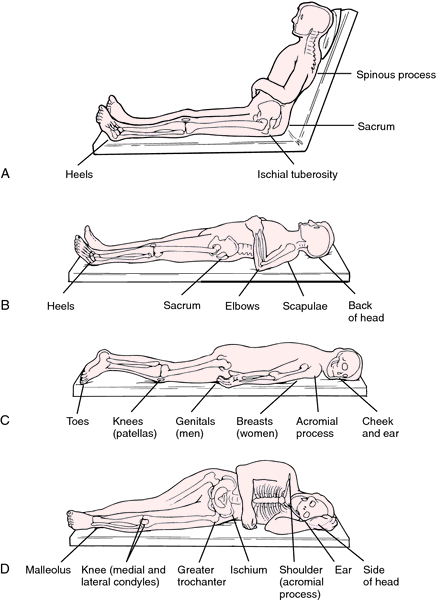 Pressure areas in common resting positions: A, Fowler's; B, supine; C, prone; and D, side-lying. a chronic ulcer that appears in pressure areas of skin overlying a bony prominence in debilitated patients confined to bed or otherwise immobilized, due to a circulatory defect. A pressure-induced ulceration of the skin occurring in persons confined to bed for long periods of time. Also called decubitus ulcer. Pressure ulcer, see there, aka decubital ulcer. Focal ischemic necrosis of skin and underlying tissues at sites of constant tissue pressure, recurring friction, and inadequate perfusion in patients confined to bed or immobilized by illness; malnutrition worsens the prognosis. Synonym(s): bedsore, bed sore, pressure sore, pressure ulcer. Bedsores don't just affect elderly patients (although the elderly are more vulnerable because of reduced mobility and ageing skin); they can affect anyone who is left sitting or lying in the same position for too long. Large scale mats could be used in hospital beds to alleviate bedsores there, and it's possible that the sensor mat could find its way into car and truck seats to reduce the lower back strain brought about from driving long distances. She said: "Thousands of nurses are losing their jobs and this could lead to a rise in the number of patients with bedsores. The research above suggests that the problem has not gone away Bedsores are almost always avoidable. Bedsores: Bad luck or bad care? A risk assessment was carried out but the appropriate NHS procedures to prevent bedsores were not taken, it was found. If you, or someone you know, is suffering from a bedsore, you should seek legal advice NOW, to assist you in obtaining compensation for the effects of the bedsore on everyday life, and to help with any treatment which may be required. In one of these places she got a bedsore and because it was left untreated she contracted MRSA which resulted in septicaemia which is blood poisoning. When a surveyor finds too many bedsores and shredded newspapers being used instead of disposable diapers, something is drastically wrong. Staff at the Royal Liverpool and Broadgreen hospitals say they cared for 85,000 patients over the past year without a single patient developing a serious bedsore. CARE home staff were accused of neglect yesterday after an elderly patient was killed by an infected bedsore. The fact may be that the resident with the bedsore was in the hospital three weeks and just returned to the nursing home, but that is not considered. He said: "When the surgeon said a bug had destroyed his flesh, I kept asking how this can happen from a bedsore.